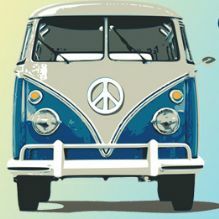 We know how important it is for you to keep your prized VW in mint condition, be it a Camper Van, Beetle, Karmann Ghia, Fastback or whatever your particular preference, which is why we offer a colour matching service to rival any in the UK. We have the ability to reproduce almost 200 original VW colours so if you know the colour code you can simply call us and we’ll mix it quicker than you can say Split Screen Westfalia (well, almost). Alternatively, if you provide us with a sample which is a solid colour (not metallic), completely flat and at least 2in2 (we suggest removing the fuel cap cover), we can match it using our spectrophotometer. We’ll then reproduce the exact colour in Rust-Oleum CombiColor 7300 in either 1L or 2.5L tins. So if nothing but L90D pastel white (other colours are available!) will do, call us today. If you prefer, we offer a similar service using Tekaloid paint, which is popular with Land-Rover and other classic car manufacturers. If you are a member of a classic car, caravan or motorhome club please contact us to get a special discount code for you and all members of your club. If you like what we do, please mention Tools-paint.com on your blogs and forums to help get the word out. If you just can’t get enough of your VW Camper Van, we can even get the paint you would need to recreate this garden shed in Cuprinol Garden Shades, in whatever colours you desire (picture from www.vwcamperblog.com). And since you clearly have an eye for a design classic, why not check out these retro tool chests which ooze style and would be the perfect addition to your workshop. Call us on 01753 684084 or 01753 686888 or email sales@tools-paint.com for more information.